Updated for a new generation, Escape The Coming Night is the bestselling book which shares the hope of Christ’s coming amidst a world of crisis. There's no doubt the world is in trouble. We see tragedy in the streets and violence in the news. We hear increasingly divisive political debates that spotlight the deep and bitter divisions in our society. We feel the pain and confusion of a culture that seems to be coming apart at the seams. As one of the world's most beloved Bible teachers, Dr. David Jeremiah is the perfect voice to help answer these questions. And in Escape the Coming Night, Dr. Jeremiah walks through the perfect Scripture for these uncertain times: The Book of Revelation. In Dr. Jeremiah's hands, this exploration of Revelation is shocking and eye-opening, but also consistently uplifting—and a vital message for our time. 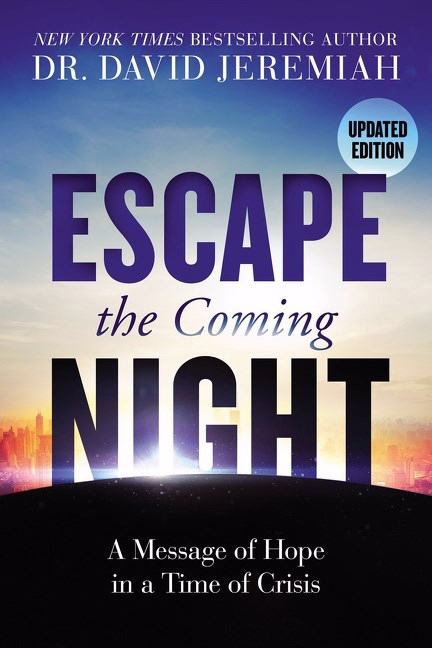 Escape The Coming Night by David Jeremiah was published by Thomas Nelson in June 2018 and is our 6199th best seller. The ISBN for Escape The Coming Night is 9780785221982. Be the first to review Escape The Coming Night! Got a question? No problem! Just click here to ask us about Escape The Coming Night.